The Institute of Medicine suggests you consume 45 to 65 percent of your daily calories from carbohydrates. On a standard 2,000-calorie-per-day diet, this amounts to 225 to 325 grams every day. Dip below this level and you may be deficient in carbohydrates. A low-carb diet purposefully creates this deficiency to encourage your body to switch to a different fuel source, which eventually helps you lose weight and stabilize your blood sugar. You may experience immediate side effects when you decrease your carb intake, but they should subside as long as you don't simultaneously skimp on fat and calories. Carbohydrates provide fuel for your body, organs and brain. When you drop to an intake below 50 grams a day, your body must find another fuel source. Ketosis is a state in which your body has switched to burning fatty acids and is producing ketones, chemicals that fuel the brain. The production of ketones is normal, but not necessary, in a carb-sufficient diet. It's easier for your body to use carbohydrates when they're available. Don't confuse ketosis with ketoacidosis, a dangerous condition in diabetic patients when their blood sugar is uncontrolled. Your body initially reacts to a carb deficiency, even a purposeful one, with fatigue, exercise intolerance, possible nausea, headaches, dehydration and overall flu-like feelings. These side effects are usually temporary. Most people report that, after a few days or weeks when their body has switched to using fatty acids or ketones, they feel more energetic, have fewer cravings and lose weight readily. If you don't see a resolution in the unpleasant side effects, you may not respond well to such a low carbohydrate intake. 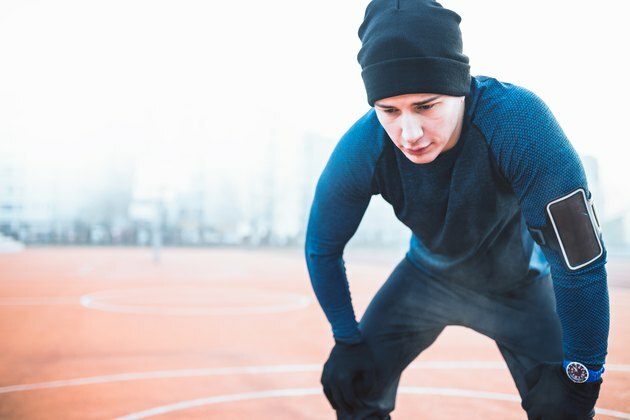 People looking to add healthy weight in the form of muscle or who are competitive athletes -- especially endurance or strength-based athletes -- may respond less favorably to a ketogenic diet. Carbohydrates are helpful in fueling energy for exercise, especially intense exercise done for long periods of time, such as marathon running or long-distance triathlon. When you substantially decrease carbohydrates to reach ketosis, you can increase fat-burning during exercise, lose weight and decrease post-exercise muscle damage. But that's when you're doing a lot of training at a low to moderate intensity, such as during an athlete's off-season. Carb deficiency interferes with intense exercise efforts, according to research published in Nutrients in 2014. A ketogenic, low-carb diet is low in carbs, but contains a high amount of fat and a moderate amount of protein. A standard ketogenic diet should contain about 75 percent fat and 20 percent protein, reports Authority Nutrition. If you eat 2,000 calories per day, this equals 166 grams of fat and 100 grams of protein. Your body turns to these alternative fuel sources, and ketones, for fuel. If you skimp too much on fat along with carbs, you'll take in too few calories and simply slow down your metabolism. The result of this type of carb deficiency is tantamount to starvation. When a woman regularly consumes fewer than 1,200 calories per day and a man fewer than 1,800, the metabolism slows. The body uses muscle to help produce the glucose it usually gets from carbs to fuel brain, organ and physical functions. When you don't get enough calories, you feel lethargic and hungry. It's not the lack of carbs only that are causing the side effects, but an overall calorie-poor diet. Does a Low-Carb Diet Make You Tired?